Q. My Pit Putty has leaked out and/or is misshapen. Help! Q. My Pit Putty is crumbling all over the place. Help! Q. My Pit Putty won't turn up. It seems like the twist mechanism is broken. Help! Q. My Pit Putty has changed texture. Help! Q. 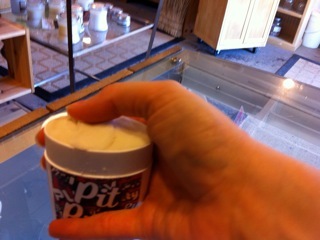 My Pit Putty isn't working to control odor. Help! Q. My Pit Putty isn't keeping me dry. Help! Q. My deodorant is giving me a rash. Help! Q. 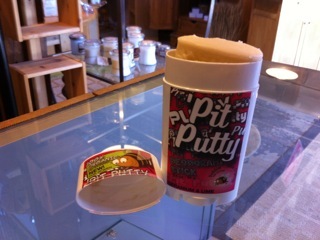 Which Pit Putty scent works the best? Q. Will Pit Putty darken/lighten my underarm skin? Q. I have sensitive skin. Will your deodorant irritate my skin? Q. I am pregnant/trying to conceive/nursing. Are your deodorants safe for me? Because there are no chemical binders like steareth-20 or propylene glycol in the Pit Putty, it is naturally a temperature sensitive product. 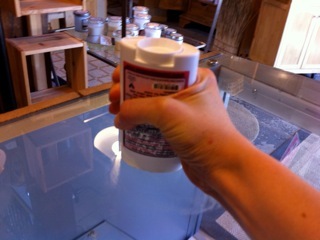 The only thing holding the arrowroot powder together is organic coconut oil, which is a liquid at 74 degrees. 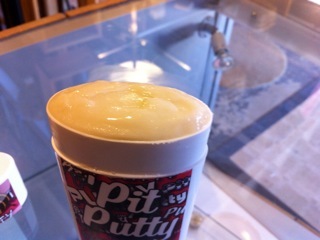 Above that temperature the Pit Putty turns into, well...putty (thus the name!) and can get misshapen during transit, in the summer months especially. There is nothing wrong with the product. Do not return it. You can easily fix it! Here is our picture tutorial. This Pit Putty has become misshapen during transit. 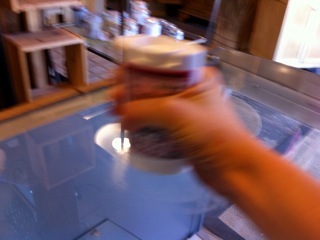 Press product firmly in to tube, making sure it becomes all cohesive. Press these pieces down in place. Your product should be sticking up above the tube just slightly. If you've lost some oil or product, twist the mechanism a couple times so the product is sticking just slightly out of the top of the tube. Now, turn tube upside down on to a clean flat surface. Press firmly and rub in circles. Your product is now nice and smooth! Q. 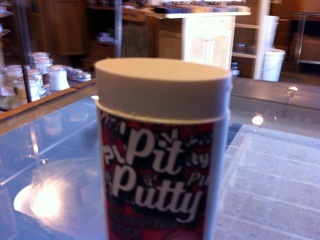 My Pit Putty is crumbling all of the place, or flaking when I put it on. Because there are no chemical binders like steareth-20 or propylene glycol in the Pit Putty, the only thing holding the arrowroot powder together is organic coconut oil. There is nothing wrong with the product. Do not return it. This is the nature of the product. Coconut oil is solid below 74 degrees and liquid above 74 degrees, so when the product gets warm, that coconut oil becomes a liquid and the powder isn't held together as well. Here are some tips to keep it from crumbling. First thing to do...is assess the texture of the product. Is it hard and crumbly or is it soft and spongy? If it is soft and spongy, you can follow the directions above to re-shape it if you like. Then simply place it in a cool spot and follow the general tips below. 1. Do not raise the product more than 1/8th of an inch during application, especially when it's warm. Only raise the product this high. 2. Apply gently. Depending on the temperature, this product can be very soft. You don't need to slather it on like a conventional deodorant. You only need one or two gentle swipes. Your body heat will melt the product fairly quickly, so don't over-apply. This is probably the biggest thing you can do to keep it from crumbling. 3. Round it off. If your Pit Putty is soft (the warmer it gets, the softer it will be), raise it up and round off the edges with your fingers. Don't be afraid to play with it! 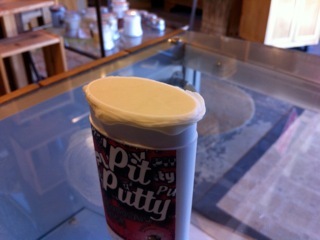 If the Pit Putty is a flat surface, the edges will have a tendency to fall off when you apply it, so having a nice dome will lessen that chance. Once you've formed your dome you can put it in the fridge to get it nice and hard. You don't need to store it in the fridge, but if your home is warm, you may want to. Or at least put it by an air-conditiong vent to keep it cool. 4. Cool it down. 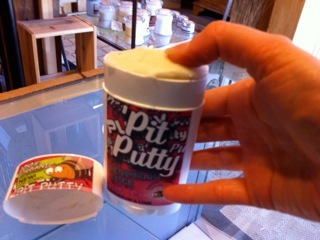 If your pit putty looks shiny like the photo below, or has a spongy texture, it's too warm. Put it in your fridge, on an air conditioning vent, or somewhere else cool. Keeping the product cool will help immensly. 5. If all else fails--Use it as a putty. When we first created this product we thought about putting it in a tin and selling it as a cream like product. However, we figured out a way to put it in a tube and it works for most people this way. But if you still can't get it to stop crumbling, you can apply it with your fingers. Just pinch off a small amount and rub in to your underarm. Simple! Don't like dealing with the powder? Our spray deodorants might be the best solution for you. Also, our cream deodorants have a bit of powder, but they go on nice and clear, so they could be a good option for you too. A. Easy fix! Your Pit Putty is too cold. Warm it up in your hands, or run a hair dryer over it for a few seconds. This will warm up the outside and let the twisting mechanism work again. Keep twisting until it clicks in and starts working. Still not working? Send us an e-mail at stephanie@bubbleandbee.com. A. 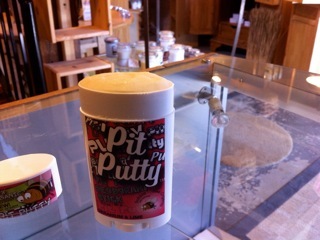 Pit Putty is a temperature sensitive product. Above 74 degrees and it will be shiny in appearance and spongy in texture. Below 74 degrees and it will be hard in texture and matte in appearance. That's because the main ingredient is coconut oil, which is solid below 74 degrees and liquid above 74 degrees. It will work the same at any temperature--it's just a personal preference. Some people like to apply it when it's warm; others when it's cooler. We recommend applying it when it's cooler, as it will be much easier to apply and will crumble less. Q. My Pit Putty isn't working. Help! A. You're in luck! We have a special replacement guarantee on our Pit Putty. We will be happy to get you a replacement. First, check out these articles to make sure you're getting the most out of using a natural deodorant. Still not working? E-mail us at stephanie@bubbleandbee.com and we'll send you a link to a hidden page on our website where you can order your free replacement. For the full guarantee policy, click here. 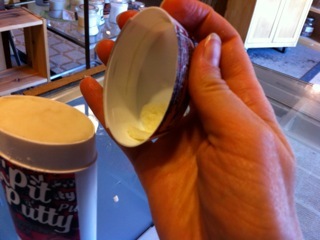 Because Pit Putty is not an anti-perspirant, it will not keep you from sweating. It does contain a lot of arrowroot powder (and in some cases baking soda) that helps to absorb sweat, however, if you are sweating moderately or more, that powder will be saturated and you may sweat it off. 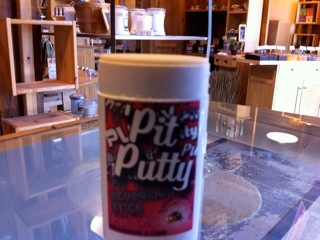 But, the great thing, is that because Pit Putty is so natural and safe you can reapply it as often as needed. Upon reapplication, that powder dries you right back up again! No natural deodorant will keep you from sweating or keep you completely dry, but this is the second-best thing! Rashes are very uncommon with our deodorants. But, of course there are exceptions to every rule. And there are many different causes for rashes. We cannot help you diagnose or treat any rashes, as that would be considered "medical advice" and we are not doctors. However, we can give you some ideas of what could be going on with you, so you can be informed when you visit your dermatologist or doctor. Sometimes when we start sweating more, especially in the summer, the sweat can get trapped under the skin and build up, causing a red pimple-like rash. This usually happens in areas like the underarm, or under other areas of skin that are constantly moist because they're unable to breathe. Applying more product is actually the remedy for this problem, because the powder helps to absorb that moisture and prevents it from pooling and getting trapped under the skin. 2. Allergic to an ingredient. It's possible that you're allergic to an ingredient in the product. Allergic reactions would usually come on shortly after you start using a product (not weeks or months in to using a product) and redness/itchiness would appear on all areas of skin that the product was applied. 3. Food or other environmental allergy. It's possible that you may be allergic to something completely unrelated. A food allergy, or a sensitivity to something in your laundry detergent. The formulas with baking soda have a slightly alkaline pH. This elevated pH helps to prevent bacterial growth and thus, odor. Skin is naturally slightly acidic, so sometimes, in people with impaired skin function, the mild alkalinity of the product can cause irritation. Sometimes in moist areas of skin, fungal infections such as ringworm are possible. 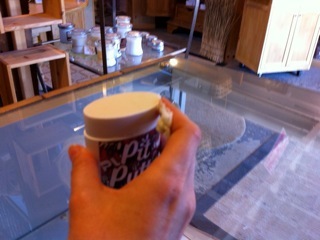 Keeping the area dry by applying powders such as those found in Pit Putty will help to keep wetness under control. Ringworm will appear to be ring-like. If it doesn't go away it may require a topical prescription treatment and you should visit your doctor. 6. Side effect of a medication. Sometimes medications can cause skin reactions. Common culprits are antibiotics and diuretics. Visit with your doctor or pharmacist to see if this is a possible side effect of a medication you're taking. Do not stop any medications without consulting your doctor. Intertrigo is a skin condition caused by skin-to-skin friction, and is common in moist areas of skin such as the groin, between folds of skin on the abdomen, under the breasts, under the arms or between toes. The simple rubbing together of the skin creates friction, and thus irritation and broken skin. Applying more product will actually help with this problem, as the powder helps to alleviate the friction. If the problem gets worse, it can get infected, so keeping it dry and clean will be important to let it heal and not get worse. If the problem persists, visit your doctor. A. If there was just one scent blend that worked for everyone, we'd just have one product! But, that's not how it works. Everyone has different amino acids and bacteria in their sweat, and actually, different kinds of smells. So, there's no such thing as one product that works for everyone. We have created a lot of scents so if the first one you try doesn't work, you can take us up on our replacement guarantee until you find the one for your body chemistry! A. Products that lighten or darken skin "alter the function or appearance of the body" and would be classified as drugs by the FDA. Our products are not drugs and are not designed to lighten or darken skin. A. We have an amazing success rate (99%+) when it comes to not causing reactions, there is no way to guarantee that one single product won't cause a reaction in 100% of the population. There are people who are so reactive that the simple act of rubbing the skin will create a rash. No one product works for everyone, not even water! Our ingredients are simple, pure, and organic and we are always working to make them as gentle as possible. If you have allergies or sensitivities, we recommend you read all ingredients posted on our website before purchasing and avoiding your known allergens. A. Yes! We have created our products with your safety and health in mind. All of our products are safe for use during pregnancy and breastfeeding. To read more about which essential oils to avoid and which are safe during pregnancy please read this article over on our blog.